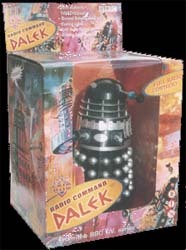 Have you always wanted your own Dalek to command? Come on... be truthful now? If not (then you are a dull person then aren't you?) then I'm sure that Product Enterprise's latest offering is a sad waste of time in your book. However, if you have a sense of humour and you grew up with Doctor Who then a Radio Command Dalek has to be just about the coolest thing you could blow your latest pay packet on. At around £70 these are not cheap, but then if you want quality you have to pay for it. The detail on these things is amazing and you can guarantee that you'll get hours of fun chasing the dog, cat, birds in the garden etc. At the very least I can guarantee you'll be running around your house screaming "Exterminate! Exterminate!" at the top of your lungs... or is that just me then? Product Enterprise have long been associate with top notch, collectable merchandise and they don't disappoint with this launch. At 21" tall, with a rotating head, flashing lights and "authentic" Dalek voice commands you can't get much more Dalek action than this. Just don't play with it at the top the stairs - I did and nearly spent the rest of the day blubbing like a baby. You'll be relieved to hear that my trusty new toy didn't come to any harm and I am still a happy bunny. Forget the price tag (which isn't really that expensive when you add up what you get for your money) go and treat yourself. You'll be glad you did.